What's New At Taste of Athens This Year? What&apos;s New At Taste of Athens This Year? Taste of Athens is back for its 22nd year on Sunday, February 22, and we know that long-time attendees and curious newcomers alike will be excited about this year&apos;s all-new lineup of events and food & drink offerings. Rachel Bailey, Development Coordinator for Community Connection and local food expert, tells VisitAthensGA about what we can expect. If you&apos;ve been a supporter of Taste of Athens during its long tenure, of even if you&apos;re simply someone in the area who&apos;s interested in food, then you&apos;ve probably caught wind of the fact that the event has changed significantly this year. Maybe, unsure what to expect, you&apos;re still on the fence about buying a ticket. If you&apos;re curious about the new look of Taste, I&apos;m here to tell you what&apos;s in store. The first thing you&apos;ll notice about Taste this year is the feeling in the room. We&apos;ve moved from the Grand Hall of the Classic Center to the lovely Atrium space and decreased the number of guests to about 1/3 of the 2,000 people who attended last year. We want this year&apos;s event to feel like something akin to a cocktail party, where you can take your time and enjoy the company of your friends without having to rush to try all the food before it&apos;s gone. Speaking of food, our chefs have taken the opportunity presented by the sharp decrease in number of mouths to feed and come up with some impressive offerings! We&apos;ve got tuna tartare and dry-aged brisket meatballs and eggplant pirogues. We&apos;ve got fried tomatillos and eggplant caponata and biscuits & gravy with duck confit. The chefs entered this year&apos;s Taste with the request to provide some of their most interesting, delicious food yet, and boy, are they set to deliver. Finally, Taste 2015 presents alcohol in a new way. Rather than having a separate table where folks can line up for wine, we&apos;ve grouped our restaurants into clusters of three and paired each cluster with its own wine, beer or spirit. We&apos;ve worked with a local sommelier to find wines that pair well with the food, and we&apos;re excited to invite our guests to play with different flavor combinations. 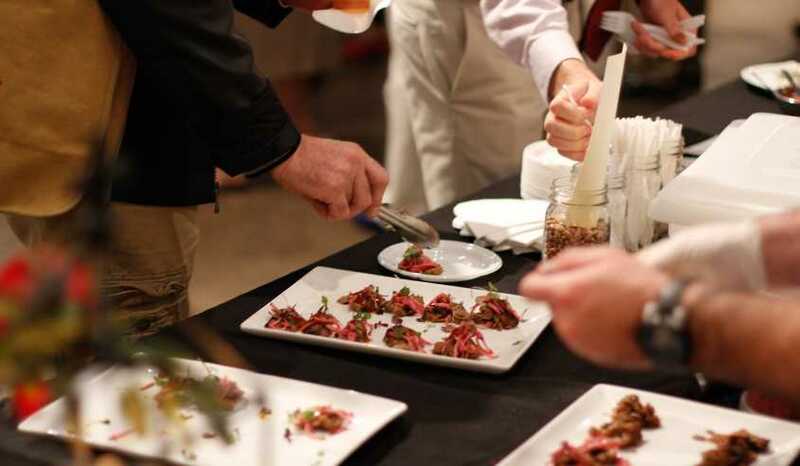 The structure of the event this year invites people to collect their wine and the "flight" of food that&apos;s paired with it all in one fell swoop, so folks can step away with a selection of different foods to try alongside their pairings. And it&apos;s not just wine - we also have craft cocktails from Kumquat Mae Bakery and Four Roses bourbon and beer from Creature Comforts and Terrapin, as well as Leon Farmer&apos;s selection of brews from all over the state. It&apos;s our hope that with diminished crowds and the thoughtfulness that we&apos;ve put into both the food and its presentation, Taste will become a more dynamic and satisfying experience for our guests, a tour of the Athens food landscape that you couldn&apos;t get anywhere else. Of course, Taste&apos;s main purpose - as the major annual fundraiser for Community Connection of Northeast Georgia - remains unchanged. As always, proceeds go to support our programs, like the 2-1-1 information and referral helpline, or the community health needs assessment we are undertaking in partnership with St. Mary&apos;s and Athens Regional. More information can be found on our website, communityconnection211.org. Tickets are available at tasteofathens.com. Contact Development Coordinator Rachel Bailey at rbailey@communityconnection211.org for more information.